We speak to the French creative on her evocative, nostalgic style and the path that led her to head one of London's best and brightest studios. Like all good art, the work of Manddy Wyckens has a timeless feel. 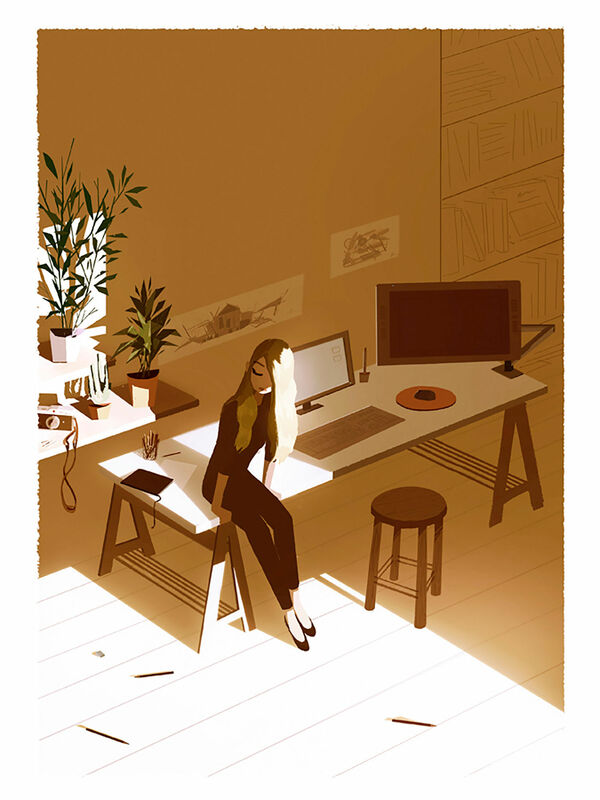 Though a young artist, art director and animator, her portfolio brings to mind the backdrops of classic Disney artist Eyvind Earle (Sleeping Beauty) and the effortless whimsy of New Yorker cartoonist Jean-Jacques Sempé. Both are among Manddy's various inspirations, a veritable mix of animators and illustrators that reflects how her works spans both fields. But ask her which side of the fence she feels most comfortable on, and there's only one reply. "I don’t feel very tied to animation anymore," Manddy says by email. "I might even be falling out of love with it, or rather with the mainstream part of it. There’s no excitement in me at the idea of going to see the latest big American animation. I feel more and more that they are products and licences rather than films." This shouldn't be a surprising admission. Having worked on background work for the likes of Disney and Dreamworks, Manddy has no doubt seen more of the business end of the cartoon industry than most. But such a heavy dose of realism isn't where the main blame lies for her feelings; it's more the lack of feelings in the first place. "I have a soft spot for Sleeping Beauty, Bambi, or The Secret of Nimh, but there are so little films nowadays that I feel are as emotionally gripping," she admits. "I am more excited by movement and motion, experiments between illustration and animation; even new technologies like VR and games." This last admission does surprise, though, as Manddy's style is so infused with that already mentioned timelessness, harking back to an era before the advance of anything digital. It's also chock-full of emotion, a subtle kind where her characters are either deep in thought or lost in movement; figures are either adrift in water, or falling through air, seemingly entranced. 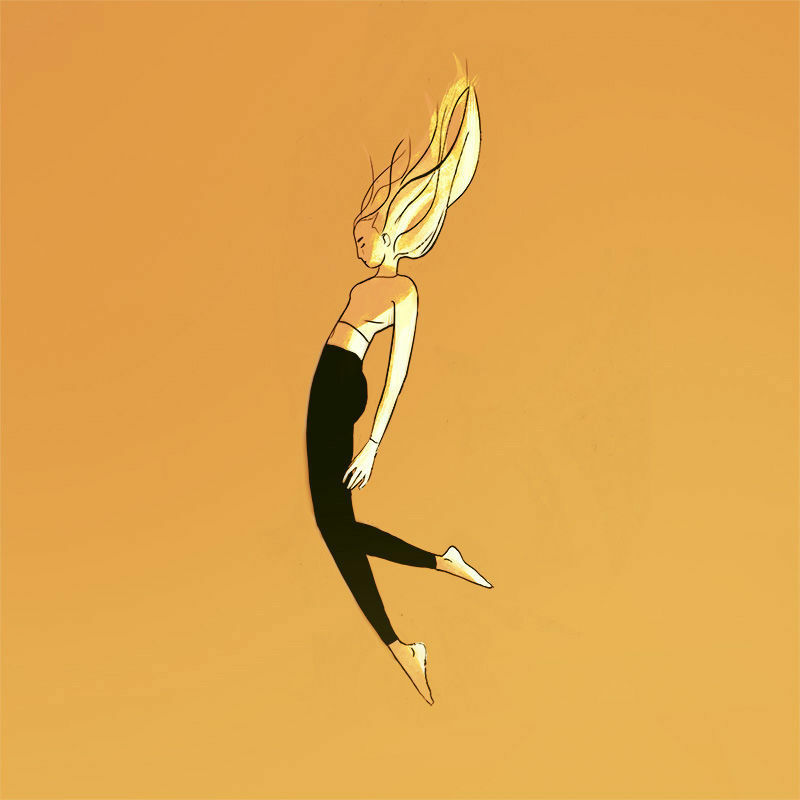 These are not always static pieces, either; one of Manddy's strengths is in her GIF art, where movement is captured with a certain graceful beauty. "In the past I said I'm more of an animator than an illustrator, but in French we have a saying that only idiots don’t change their mind. That's why I think I’m probably more of an illustrator now, and less of an idiot," she jokes. "However, I don’t do illustrations professionally. I don’t get paid to illustrate. So far, my illustrations are expressions of my state of mind, a place to blow off some steam. I’m quite happy I have this little field of experimentation all for myself." Manddy's day job is as a director at the London-based Studio AKA, an outfit best known for its award-winning cartoon Hey Duggee (which is loved by pre-schoolers and parents alike). The agency has also created the titles for the recent Gnomeo and Juliet sequel, Sherlock Gnomes, and some of the more interesting bank adverts made in recent years. "Studio AKA has the loveliest people you can meet in animation," she says proudly. "Being there, it’s like being part of a family. They support you, invest in you, provide what you need for growth. I’ve been lucky to be offered to join in. You can tell they’re proficient in what they do, very in control of their craft and hence things always go very smoothly, even for fast turnaround projects. It’s the perfect place for me these days." The Studio AKA gig follows a directorial spell at LA studio Chromosphere, prior to which saw Manddy do various freelance stints as far afield as Australia, Spain and the States. I ask her how she's found the shift in changing from freelancer to a managerial position. "I think there is only so much you can do as a freelancer," she replies. "At some point, you start going in circles and you need the structure to help your growth, and you need the people to help you to go in the right direction. I think I achieved all I could achieve as a freelancer and now I just need to be sort of 're-potted' into a bigger pot to keep evolving and growing." Manddy views her journey from freelancer to art director as a classic underdog story. "In animation, I meet a lot of people who come from upper middle class or wealthy families," she explains. "They are people who knew early what they wanted, got into good schools and found a cosy spot in a big name studio, and who automatically assume I’m like them. Truth is, I come from a very modest background and I had to make a big effort in order to gain enough self-awareness to believe that doing art is something I could make a living off. I held off on it and only started drawing after graduating high school." "Going to college was something that’s never been done in my family," she continues, "and all of my college experiences required lots of sums as well as lots of paperwork in order to get all the scholarships available. My initial plan was to become a librarian or literature teacher in order to have some spare time to do my art. I lost time pursuing that goal before starting to believe maybe I could do art as my main activity. Believing in yourself when a lot of things work against you is really hard, and I honestly struggled a lot not giving up on wanting to be an artist." I ask her how things eventually paid off. "After some years of being persistent, things became a bit easier,"she tells me. "I sure was working a lot to make it all worth it, taking every opportunity I was offered because I was tired of waiting quietly for my turn. It resulted in long studies, a very pugnacious mind set - and a very late graduation. I’m very self-aware of the fact I’m a late bloomer and how I've sweated a lot to get to the same place as other people. I wish it had all been easier and I could have started it all earlier. But, as my friends say, that’s probably what gives me my ‘edge’, I suppose." This long journey also saw Manddy find her voice as an artist. "I think I've always wanted to be able to do everything, which makes my ‘voice’ very unclear because I do jump in styles and mediums," she says. "And of course, during my training years, I tried to conform to other people’s art around me, which always left me with the feeling of not being able to really fit in. After that, I went back to what I liked, to be very selfishly focused on my references, my influences, and it all lightened up for me as soon as I started listening to myself rather than listening to my environment." Part of Manddy's voice is a focus on the female form; most of her character work is based on women. I ask if that's a deliberate decision, and whether there's any impetus behind it. "I think it’s my way of re-appropriating the female form," she explains. "I used to walk the line of androgyny, mixing things up and having a very fluid definition of gender, mostly because I had self-image issues. But then, I decided to invest in and 'own' female codes, to feel more comfortable in my body, and I think that shows in my art. My work is an expression of my conflicted relationship with womanhood. It is both a fascination and research; almost a fight." Heady stuff, but it's still undeniable how effortless and eye-catching Manddy's work is. We can see it in this Studio AKA commission for San Pellegrino below, where Manddy's world comes to life with her usual joie de vivre. For animated projects like these, Manddy's process is a classic one. "First it's thumb-nailing on paper, then putting it through TVPaint or Photoshop for animating. I’m not a great animator, but I rely very heavily on my ability to draw a strong pose and to ‘feel’ things in the right way. I have also, I think, a good eye for animation. My technicality with things like timing and spacing is a bit lacking, but I hope it’ll improve with practice." In the near future, Manddy hopes to keep working on her passion project, a children's book called Wildlings. "Wildlings is me trying to reconnect with my literature-driven 'writer self.' The story is about a little girl’s survival in the wild and how to deal with loneliness as a kid, and how to make friends, face hostile situations, and savour the happy moments. In many ways I’d say it’s a sweet and raw book." She also no plans to leave London in the near future, either. "English-speaking countries are where I feel most creatively comfortable," she rhapsodizes. "There’s something exhilarating about being abroad. You see very concretely how you’re pushing boundaries, and you’re always letting yourself be changed by what’s surrounding you. So far, I feel pretty good in London. It’s a pretty intense city. You cross a lot of people’s paths, but you can also disappear in the crowd or just get some downtime writing away in public parks. To me it’s less uptight and anxious than Paris, and less ‘plastic’ and hollowed out than LA." A timeless city, then, for a timeless artist to feel at home in. Find more of Manddy's work on her page at Studio AKA, and be sure to follow her hugely popular Instagram.